● The death toll in Mozambique on Saturday climbed to 417 after a cyclone pummelled swathes of the southern African country, flooding thousands of square kilometres, as the UN stepped up calls for more help for survivors. ● Cyclone Idai smashed into the coast of central Mozambique on Friday last Week, unleashing hurricane-force winds and rains that flooded the hinterland and drenched eastern Zimbabwe, leaving a trail of destruction. The new numbers take the combined death toll of the two neighbouring countries to 676. ● The UN, warning of more suffering, stepped up calls for help in Mozambique as aid agencies struggle to assist tens of thousands of people battered by one of southern Africa’s most powerful cyclones. 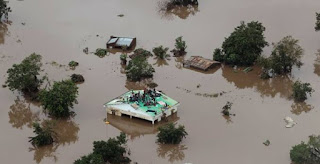 A week after the storm lashed Mozambique with winds of nearly 200 km per hour, survivors are struggling in desperate conditions some still trapped on roof tops and those saved needing food and facing the risk of outbreaks of disease such as cholera. ● “The situation will get worse before it gets better,” UNICEF Executive Director Henrietta Fore said on Saturday. ● The World Food Programme late on Friday night declared the flood crisis a level three emergency, putting it on a par with crises in Yemen, Syria and South Sudan. More than two million people have been affected in Mozambique, Zimbabwe and in Malawi where the storm started as a tropical depression causing flooding which killed 60. Hundreds are still missing.